One of my good friends L put me in touch one of her friends who was having a cruise ship wedding. When it was determined that my schedule wouldn’t allow me to go to DJ for her, she still wanted a mixtape of her and the groom’s favorite songs done by me. She arranged for the ship’s DJ to allow her to play the cd. Now I know he ain’t gonna be happy when he see them having a ball to my set and sitting during his…but…that’s not my problem. We contracted a nice rate, she sent me her list of 50 songs. I pared that down to 34 and I produced a pretty tight mix. Matter of fact…the mix was so good I needed to share it with yall too. It has everything on it from hip-hop to soca. A little reggae, some R&B and of course some old school. This is not the final mix that I’m producing for her but it will be very similar with specialized drops and such. 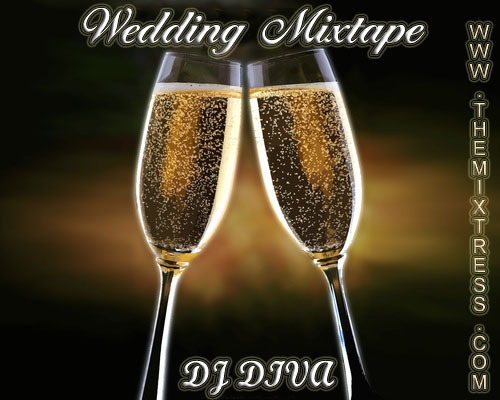 I will be hyping my customized mixtapes for hire in the future so i hope you email me at djdivathemixtress@gmail.com if you have need for something special. For my friend L I made her cds for her 30th b’day with a song from each year of her birth. She gave them out a party favors on her b’day trip to Vegas! I’m also excited about this because I know my niche is small parties and weddings. There will be more info forthcoming about contracting me for that. 9. Hypnotized – Notorious B.I.G. I love this mix!!! What a wonderful idea! When I got married in the islands, I had to rely on my auntie to do the DJ interviewing for me since the DJs did not have mp3 files to share. Although the DJ was decent, I was very nervous. I am having a 40th birthday party this year. I would love to have you do a mix of songs that I can give away as favors! That is a hot mix! I may have to get you to make me a mix. @Amber I look forward to helping making your party a smash! @MzNewy Long time no see! Send me a request! I love them!! from you real soon ! This is another awesome mix Margret i tell yah, yuh getting better all di time :-)no where but the top fa yah girl.